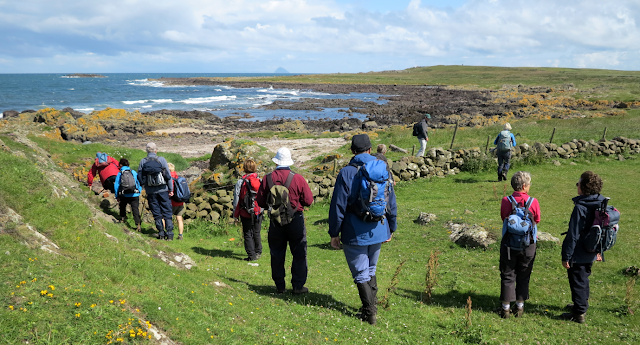 Thomas, Frances and Rachel drove to Dally Bay where other walkers had already arrived: Florence (leader), Linda, Leslie, Allan Leiper, Richard, Mary, Jim, Mike, Peter, Peter (x 2) and John. Duncan had not got there by the time we started the walk, late, at 10.15am but, since he was the backup, Florence knew he would be able to catch up with us eventually, which he did, not long after we had set off. He had got lost on his way there, with Audrey, Christine Sloan and Charlotte. Eighteen walkers met up near South Cairn for the coastal walk from Dally Bay to Corsewall point and the lighthouse. The weather forecast was favourable with broken sunshine and a cool wind. Accessing the coastal path via a farm track, the first visual delight came in the form of flocks of Eider ducks swimming around Dally Bay. 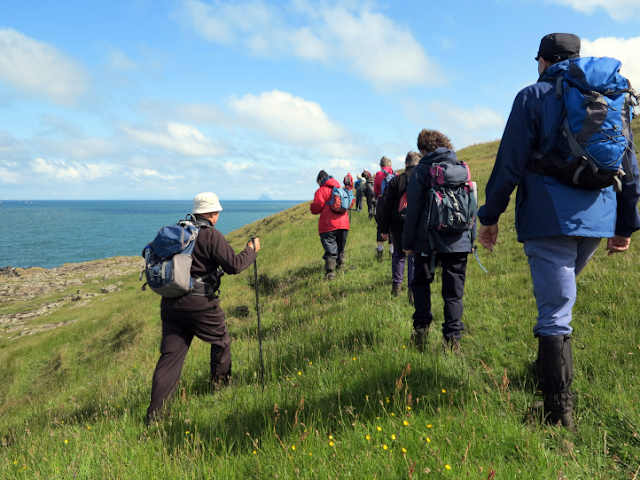 This was only a prelude to the vast number of sea and land birds seen throughout the walk north. Gannets, Plovers, Shags, Curlews, Oystercatchers, Peewits, Fulmars and various divers were among the species identified. To begin with, the path was occasionally boggy. Small burns were carefully crossed. A misjudged step resulted in the occasional wet boot. A short distance out in the bay stood the concrete plinth of the now redundant Ebbstone, once a shipping beacon. There was only one boggy bit to negotiate as we were keeping low down some of the time, on the rocks. 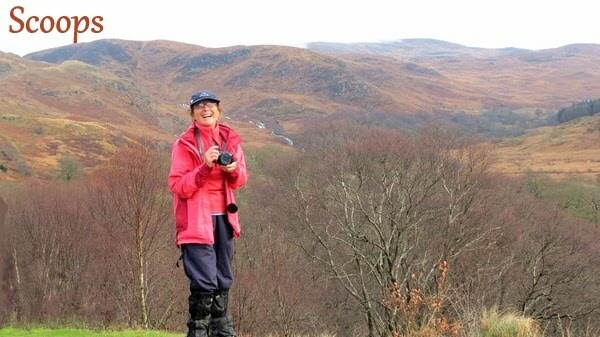 However, as the walk progressed, Florence took the group up higher along a good track. Thomas often stayed below us, walking close to the sea. After following the rocky shoreline beyond Portlong and Portnaughan Bays the group reached the ruins of the North Cairn Radar Station. Here the walk leader explained a little of the history of the site. Chain Home was the codename for the ring of coastal ‘Early Warning’ radar stations built by the British before and during the Second World War and North Cairn was part of that ring. It’s easy to imagine, considering the substantial remnants that remain, the hive of activity of up to 300 personnel scanning the skies for danger. On reaching Port Gavillan, a short stop was taken to look over at the activity on the Genoch Rocks. 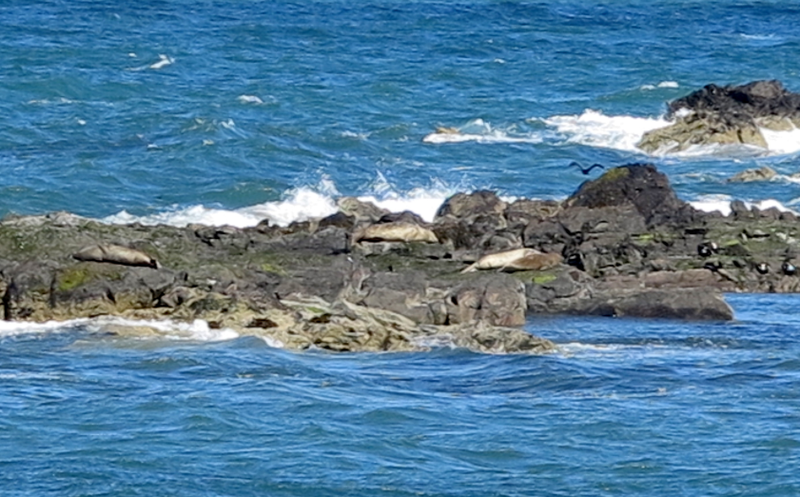 Seals were in abundance. While a number basked on the rocks others in the water kept popping their heads up. 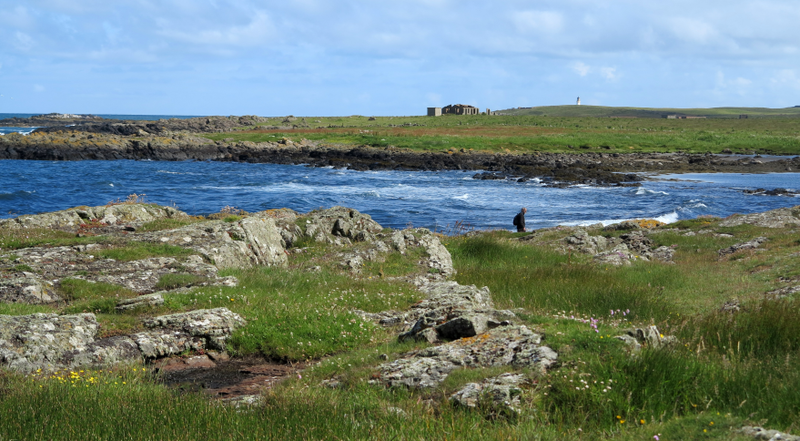 One small peaked outcrop was white topped with guano from the colony of shags in residence. We had been going along very slowly as we were getting lots of wildlife stops to view the dozens of ducks bobbing about in the bay and shags on the rocks nearby. 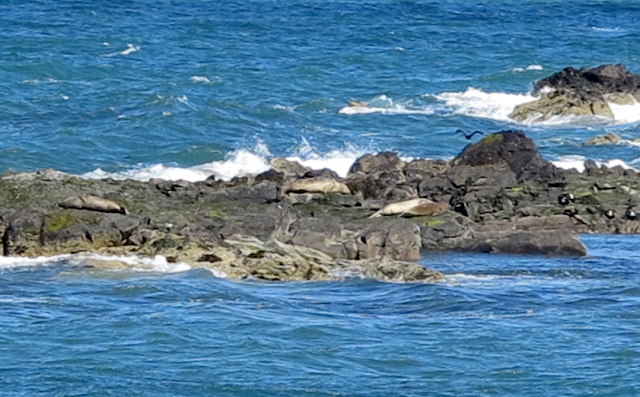 Later on we saw many seals sunning themselves on the rocks and many more seabirds making an appearance. 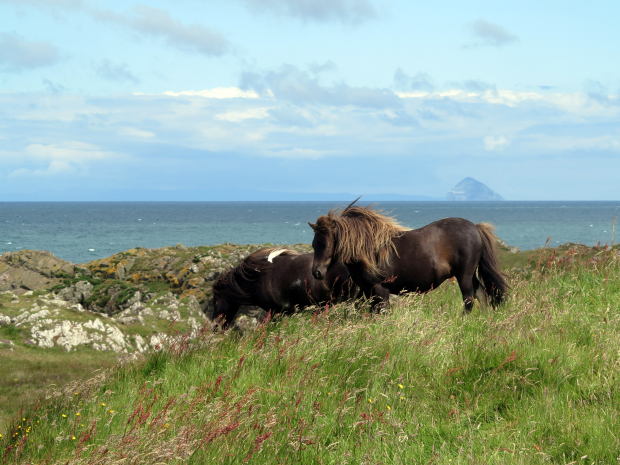 The walk continued with constant views of Ailsa Craig and ferries from Loch Ryan across the North Channel and, to our delight, of two ponies for a short while. Wild flowers flourished and delighted the amateur botanists in the group. Various campion, ragged robin, forget me not and wild orchids were abundant. Approaching Corsewall Point, a mention was made of the wreck of the Firth of Cromarty in 1898 and her cargo of whisky. Needless to say, a short forage by a few ramblers proved fruitless. 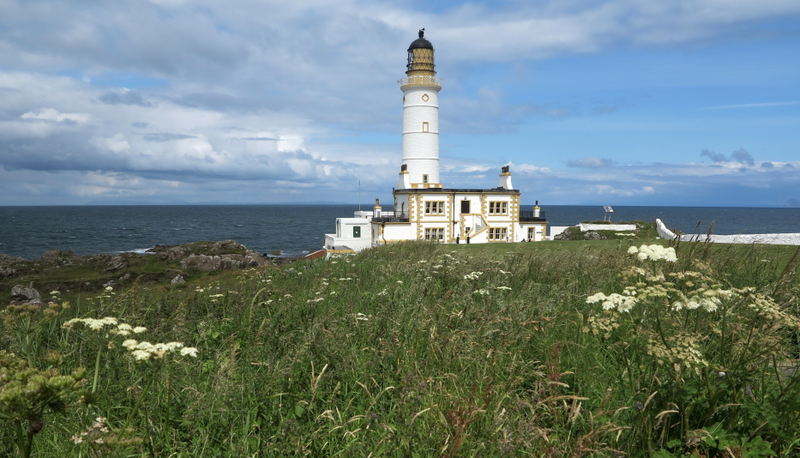 After passing Oust, Bloody and Horseback rocks, Corsewall Lighthouse was reached. Looking resplendent with a fresh coat of whitewash (do they still use whitewash?! ), this magnificent structure designed by Robert Stevenson and built in 1815 is now a luxury hotel. A lunch break was taken overlooking a sheltered rocky inlet just beyond the lighthouse, where we saw gannets flying by in both directions. After lunch the group now headed inland for the return journey by road and farm track which seemed endless! Heading east they passed the ruins of Corsewall Castle. At the next junction they turned southwest where a gradual incline took them beyond the farms of West Kirkbryde and Knockneen. Views of the Ayrshire coast, Arran and the Mull of Kintyre were extensive. Even the Paps of Jura made an appearance. The delightful cottages of Kellies and Arran View with their many strange and wonderful garden ornaments came next. Reaching North Cairn, a recently constructed track took them now to Knocktim from where the road to South Cairn took them back to the cars. A wonderful day walking was concluded with a visit to the Conservatory at the Soleburn Garden centre for tea, coffee and cakes. I put four tables together and someone added another one so we were able to sit all together, Mike, John and Peter being the only ones not joining us. This walk never disappoints us, it's a beauty.